Part scavenger hunt, part food drive, part bike ride. Cranksgiving allows the cycling community to give back to the places where we ride. Navigate the streets of Ann Arbor and the aisles of grocery stores searching for specific food and personal items. Once you’ve found them and made your way through the checkout lines to the finish line, all of your food and personal items will be donated to Food Gatherers, EMU’s Swoops Food Pantry, and Ozone House! Bring a bike, a bag or backpack, a lock, and some cash. 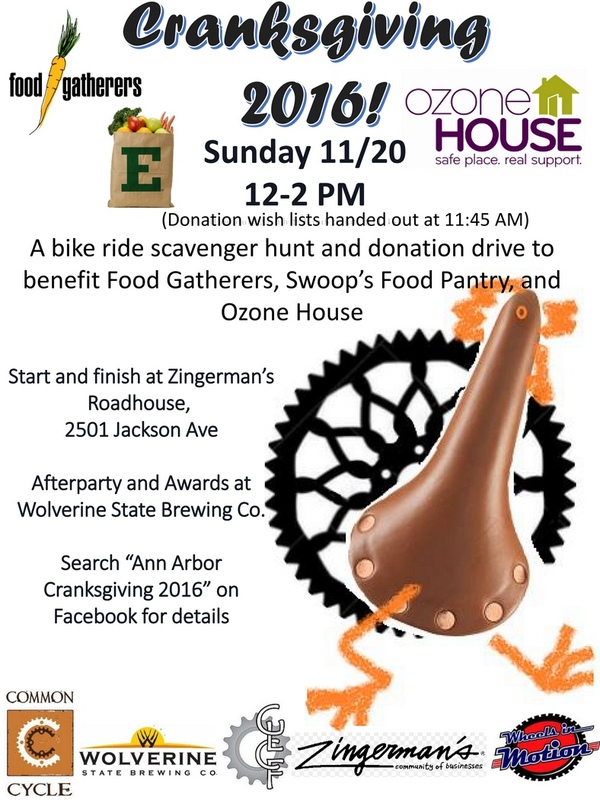 There will be an after-party at Wolverine State Brewing Co. (2019 W Stadium Blvd, Ann Arbor, MI 48103). Prizes will be handed out and you will be able to purchase food and drinks. Common Cycle will be hosting open repair sessions through March, taking place roughly twice per month at the same time as our traditional Mobile Repair Stand. The sessions will be similar to our weekly mobile repair stand at the Sunday Artisan Market, and provide those interested with access to warm, dry space, tools and volunteer help as needed. Feel free to drop by to get help preparing your bicycle for the winter, and to keep it rolling until spring. If you have any questions, please email us at info@commoncycle.org. 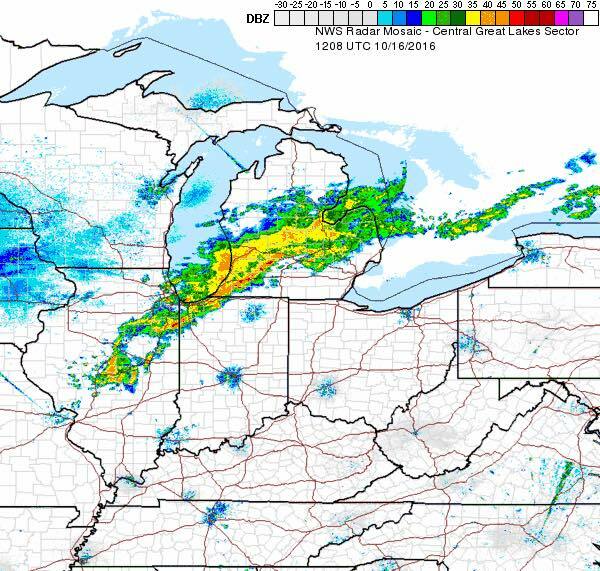 10/30 weather update, 10:45 AM: It appears the rain is tapering off, we will haul up to Kerrytown for today’s repair stand. Hope to see you there. Our last Sunday Mobile Repair stand of the season is taking place on Sunday, 10/30/2016 from 11 AM – 3 PM at the Kerrytown Artisan Market**. We’re also planning to hold open repair sessions with some frequency throughout the winter months; stay tuned for details. We’re going to be setting up inside UM Outdoor Adventures today instead of Kerrytown, due to rain. We will run an open workshop from 11 to 1 at least. Same as the usual Mobile Repair Stand, except dry! Common Cycle’s Six-Week Fall Maintenance Class will begin Thursday, October 13th and run on six consecutive Thursdays from 6:30-8:30 in Ann Arbor, concluding on November 17th. Classes will be held at UM Outdoor Adventures Center, 336 Hill St, Ann Arbor, MI 48104. We cover a range of repair and maintenance from basic (e.g. tube change, brake adjustment) to advanced (e.g. hub overhaul, wheel truing). Please fill out the linked application if you would like to attend. Please note that this class is capped at 15 people. If selected, we expect participants will attend all 6 sessions and all participants are expected to attend at least 2 mobile repair stand or other events over the following 12 months. Applications close Friday, September 30th or when the class is full. Please respond or email info@commoncycle.org with questions. This Sunday, September 11 the Artisan Market will be closed for the annual Kerrytown Bookfest. We will be setting up the Mobile Repair Stand in our second alternative location: On the western edge of the Community High School grounds, just across N 5th Ave opposite the Market. Hope to see you Sunday. We’ll be back at the normal location within the Market on Sunday 9/18. Our friends at Back Alley Bikes / The Hub of Detroit are apparently in danger of shutting down due to some significant interruption to their operational funding and recent staff turnover. It appears they’ve been trying to raise funds for the last month or two, but are well short of their goal of $6K. On behalf of the Common Cycle board, we feel that Back Alley is a critical part of the bicycling community in southeast MI, not only for the good work they do, but for the fact that they’ve been around for eight years and are very much an established resource for people in need in Detroit/Wayne Co. Any risk to their ability to continue their work is a big deal. If you can, please consider pledging your support and/or spreading the word to others who may not already be aware.